FC Penarol, pictured here in action against Michelin this season, are on the lookout for a new manager. 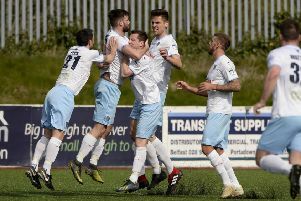 Ballymena Saturday Morning League side FC Penarol are on the lookout for a new manager. The long-established club, which celebrated its 40th anniversary last year, is currently inviting applications for the post of manager or player/manager. Penarol will start next season in Division Two after finishing bottom of the top division this season. Anyone interested in the position should contact John on 07518 466626.